So it’s the third week of 2019 and I’m just now writing the second post of the year, a year for which I had planned to write one post a week. But, you know what? It’s ok. It takes a while to build the momentum. I’m making much better progress on one of my other big goals for the year — read 150 books in 2019. I know. I KNOW! it’s a ridiculous goal and far beyond anything I had thought I would shoot for. But here’s the thing. I already read 136 books in 2018. So building on the momentum that I’ve already built up (see where I’m going with this?) I should be able to hit that mark. Or at least come close. When you break it down that’s about three books a week, which is about what I read anyway — one print book during the week, one on the weekend, and an audiobook a week. Does this sound absurd? Maybe. But just like with knitting, I’m finding ways to fit books into the pauses of my day (and it’s actually easier than with knitting). When the kids are playing, or eating a snack, or watching a tv show, I have a book close by. They are in a stage where as long as I sit right where they are they are generally happy, but if I get up to do anything — dishes, laundry, make food — they lose their minds. I used to feel guilty about it, what kind of mother sits and reads all day instead of doing enriching activities with her children? But then I realized that they don’t necessarily want me to play with them all the time, and that time when I’m sitting quietly is much better spent reading than playing on the phone or watching tv. Children imitate what they see, and I want my kids to see that reading is a fun and important part of life. We’ll see if I can keep this momentum through the year, but right now I have high hopes. That might be because Chris took the boys to visit his parents over the weekend so I had the house to myself for three days, allowing me to do things like read and knit at the same time or read a book in a day! Are you making any reading goals for yourself? What parts of your day do you use to squeeze in some extra reading, knitting, or other hobby? It's been a while since I checked in with my 2017 word of the year -- intentional. One of the ways I planned to incorporate that into my life was through my reading. Well, we're nine months into the year and I definitely have read a ton, and most of it has been intentional. As of this writing I have read 73 titles this year, which is a significant increase over the 48 or so I have read every year before since I started tracking. This summer our local bookstore, Page 158, ran a Book Bingo promotion. It started on Memorial Day and ended on Labor Day. Everyone got the same card, and you earned store discounts based on how many titles you read. I came up three books short from completing my entire card, but we had a busy summer so I'm rather pleased with how much I read. It's been a while since I geeked out about books with you, so I thought I'd share some of my favorites from Summer. Now I realize that all of these are new releases, but between visiting the bookstore and library every week with Pasha and getting a Book of the Month box most months I was susceptible to new titles. I got this in my Book of the Month box despite the fact that I was a little apprehensive, but I ended up loving it so much I read it within 24 hours. This is a fairly quick read, all written from a unique first person perspective. At first the narrative flow made no sense, but the more immersed I became in it the easier it was to follow. I found myself really connecting with the fact that the narrator is a grad student and all of the pressure and apprehension she has, even though my field was History and hers is Chemistry. This was another quick read for me, probably because I listened to the audio version. 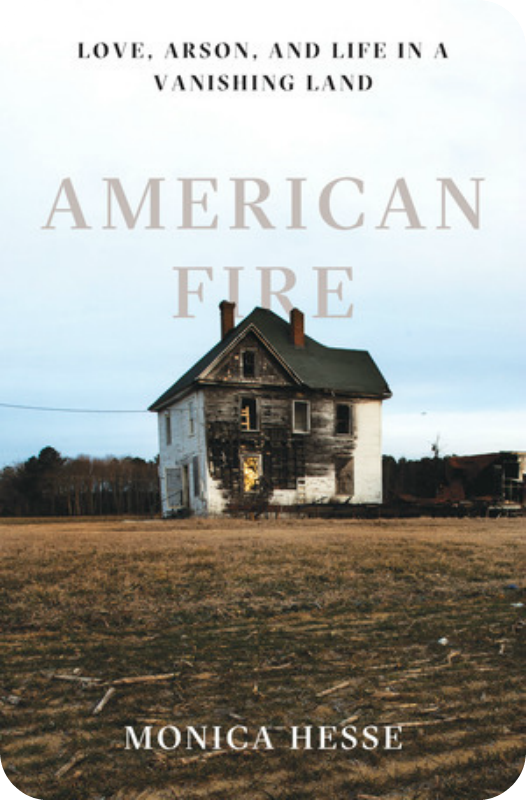 I've been taking a narrative tour this year of what I like to refer to as "overlooked and oppressed America", starting with Ghettoside, Evicted, Hillbilly Elegy, and now American Fire. I find that these investigative nonfiction books are easier for me to take in as audio rather than print because I can listen while chasing Pasha. Because the author is a journalist it was more like listening to an extended NPR story than a heavy work of nonfiction. I'm combining this with the sequal (prequal?) Down Among the Sticks and Bones because I read them both in quick succession. These are very quick YA reads that I don't know how I missed, but they were a ton of fun. In the creepy, cannot put them down kind of way. I was a morbid child growing up, at times much to my mother's dismay. I had an illustrated copy of Hans Christian Anderson stories (that Chris has been reading to Pasha and then coming downstairs horrified by the "real" Cinderella), and as soon as I could read chapter books I devoured books like Mary Poppins (much darker than the film version). These books filled that need in my reading life without going full Gillian Anderson dark. Probably my favorite book of the summer was Brush with Death. This got filed as my funny book, but it really could have gone into a lot of categories. You guys know I love Urban Fantasy, though I'm rather hesitant to start new series, and I've been at loose ends for a new one since The Hollows ended a few years ago. Well, turns out I was just waiting for this book. Full disclosure, Ware is the pen name of a friend of mine, but she's a newer friend and we had not gone full book nerd with one another just yet. Brush with Death is about Sadie Salt, a paranormal dentist who lives in a small town in the North Carolina mountains. She is in debt to some scary magical folk, has the necessary tragedy in her past, and finds herself becoming more entangled with the secret magical community as the book goes on. Where this book really shines is the witty writing, which I can attest continues into book two. How do I know this? Well I can't really disclose, but I may or may not have gotten a sneak peek at Bad Impression, which should be published next week. If you are in our area Ware will be doing an author event at Page 158 and she'll have copies of both her books there. What have you read lately? I'd love to hear your recommendations. It's always fun to notice unintentional trends in my reading. We've already established that I tend to read books by female authors, but now I'm finding myself reading books with even more in common. For example, the last two books I read featured female characters who went to high school around the same time I did. That's probably not a huge thing to most people, but they came out last month and thus have a nostalgia for that time. A nostalgia for the early to mid 2000s? That's a bit different. The first book is Marlena by Julie Buntin, which I got in my March Book of the Month box. It took me a little while to get in to the story, but once I got reading I was hooked. It's a coming of age story, which is rather done to death, but it is framed through the narrator, Cat's memory. When the story starts we know that Cat's friend Marlena died while they were teenagers, but we don't know the events leading up to it. We then spend a few days with Cat while she tells us about the year she lived next door to Marlena, becoming friends and falling in with the "bad crowd." I'm struggling to describe this book to you because I think what did it for me was the atmosphere. There are a ton of books in the coming of age genre, but the fact that Cat is discussing it as an adult and is recognizing the impact the events have had on her life gives it a different flavor. It almost reads like a confession or a therapy session. At one point she comes out and tells the reader she is glossing over events and goes back to change some aspects of the narration. I don't want to spoil it for you, but it's not a mystery or a thriller, just a really good gut punch of a book. And like I said, the atmosphere is spectacular. Immediately after finishing Marlena I read Dead Letters, which initially turned me off due to the cover art, but the description was interesting and my hold number came up fast at the library. Like Marlena, the narrator of Dead Letters is also a woman in my general age range. This time our protagonist is Ava, who has returned home to rural New York after her twin sister Zelda is believed to have died in a fire. From there she finds herself following clues left by her sister in a game that is very reminiscent of early Pretty Little Liars if A was (spoiler) actually Allyson. This one seems to be defying categorization with some arguing for mystery or thriller and others for literary fiction. Regardless of category I was surprised by how much I enjoyed this. I found all of the characters insufferable, but all in very believable ways. And while I myself did not drink while reading this book I find myself feeling a little tipsy thanks to all of the wine that flows through the story. I'm on the record as someone who often figures out the answer before the end of the book, but not with this one. I was guessing the entire time and even found myself batting around some loosely conceived theory of astral projection based on a Lois Duncan novel I read as a kid. But there is nothing more mysterious than technology at play as you fall down this rabbit hole. So that's a bit about what I've been reading lately. What have you read recently that you enjoyed? Tell me about it in the comments! And then I went to college and got buried in school for the next five years. Like many students I was completely burned out and had no desire to read anything for quite a while. I made half-hearted attempts to start reading more, but for a while it seemed like I was never again going to read like I used to. Well, that seems to be changing. This was supposed to be my Kindle book for the month, but I got the audio as well in a deal of the day and became completely consumed by it. I listened to it constantly. While cleaning, while taking Pasha for walks, while knitting. I've always loved the idea of diverging timelines, and this one really pulled me in because it set what is generally a sci-fi concept in a literary romance. The story centers around two protagonists, beginning with a specific moment in their lives and following the various paths their lives could have taken based on how that moment played out. The gothic romance-loving teenager in me was particularly pleased that there was no perfect version. Each had its joys and its tragedies. For those of you not keeping track at home, Pasha is fast closing in on his first birthday, which means that we've started experimenting with solid foods. We began with the requisite smashed peas and banana several months ago and have slowly added in more and more foods. As a guide to when and how to mix more foods this book was ok. Mostly it dealt with allergies and how to deal with various health issues. Not really what we are dealing with, but it was nice to have our progress reaffirmed. I'll confess, I didn't read all of this book. I waffled on telling you about this one because I honestly did not like it. Some of it contained good advice -- give your kid healthy choices from the outset, teach them to try everything -- but a lot of it focused on "French parents are awesome, you Americans need to be more French." I'm sure there are a lot lessons we can take from French-style parenting, but I don't think anyone's time was well served by all of the stories of her French friend who served her kid elaborate and unusual foods that a lot of people cannot even access, let alone afford to feed their toddler. I devoured Kim Harrison's Hollows series, so when I heard that she had written a prequel I pre-ordered it without a second thought. There really is no way for me to explain the premise without spoiling large chunks. That, unfortunately, is the nature of prequels. I personally really enjoyed it once the titular event began to unfold. The protagonist is another strong female, but this time she is not a witch, which was a fun change from the previous novels. I don't know if it would be as fun of a read if you have no working knowledge of the world of The Hollows. I saw some reviews on Goodreads that asked why certain things were left unsaid, but which were plainly obvious if you had read the other books. So if you are a Harrison fan, give it a read. Otherwise start with the original series. Short story collections are something that I am starting to turn to more often. They are easy to pick up during nap time and drop when the dog goes crazy because the mailman dared to stop in front of the house. They also fit nicely in my purse for those times Pasha falls asleep in the car. I'm still trying to process this collection, because it was largely unsettling. Most of the stories were about unhappy people living what appear to be ordinary lives but with some sort of uncomfortable twist. And be prepared, they often end in medias res. It was good, just really weird and often disturbing. I highly recommend it. As long as that is your kind of thing.